Overlooking Eyre Square, Hotel Meyrick is the home of Christmas in Galway city centre, and the ideal location for a Christmas party or get-together. 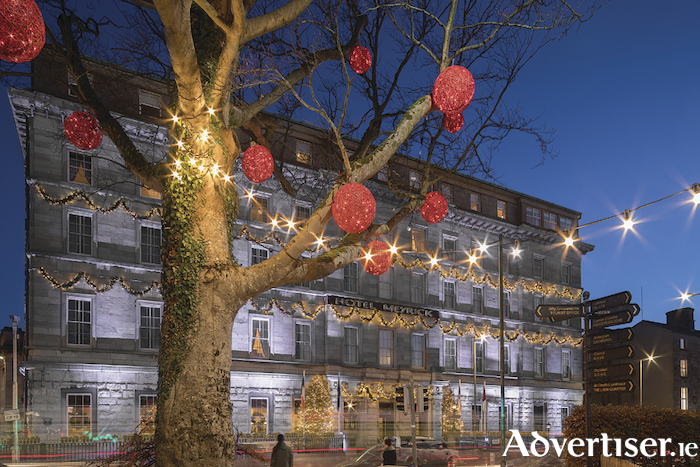 The magical Hotel Meyrick serves up a feast of festive experiences with delicious food, exceptional service, and lively entertainment. This is a truly beautiful venue, none more so than over the Christmas period. It is full of atmosphere and right in the heart of the city. Already booking fast on key dates, the city’s favourite casual dining venue, the Gaslight Bar & Brasserie invites guests to savour dishes such as maple and gin glazed belly of pork or smoked salmon and crab roulade to start; roast turkey with a herb stuffing roulade, ham hock croquette, creamed cabbage, and cranberry sauce, or chargrilled fillet of beef for mains; or the Meyrick’s famous Christmas pudding for dessert. Guests always appreciated the large sash windows taking in the seasonal festivities on Eyre Square. Having been awarded an AA Rosette for its excellent food this year, the buzzing atmosphere combined with delicious menus at just €35 per person for three courses with tea/coffee, make the Gaslight a firm favourite for office parties and celebrations. Enjoy festive dinner followed by party favourites and Christmas classics with the Meyrick house DJ. Festive lunch bookings are now also open, with two courses from €19.50 and three courses from €23.50 per person, served until 3.30pm. As prime dates are already booking up call to book your Christmas party today. Friday December 7 and Friday December 14 are already booked out. For a more traditional setting, invite your guests to enjoy the enchanting ambience of the award winning No 15 on the Square restaurant. With options such as slow cooked pork cheek, roast turkey and ham, or fillet of beef, the menu at No 15 on the Square is bursting with flavour and seasonality. The festive dinner package is €35 per person for a three course meal with a glass of house wine per person and tea/coffee included. After your meal, continue on your night in the Oyster Bar, with live entertainment. Again, key dates are booking out at No 15, with Friday December 14 already fully booked.